The Arabian is regarded as the oldest pure breed, but its exact origins remain unproven (for lack of scientific evidence). Antique sculpture and ancient rock drawings depicting horses of Arabian appearance found in the Arabian peninsular, as well as wall inscriptions in Egypt, confirm that an Arabian type has existed in the Middle East for well over 3000 years. These Eastern, or Oriental, horses are considered to be the taproot stock of all Southern hot-blooded equines, as opposed to the Northern cold-blooded. As an old pure breed the Arabian is extremely prepotent, and for centuries has been used up-grade, with the result that there is hardly a breed of light horse that does not contain some Arab blood – the most outstanding breed to evolve from Arabian sources is the Thoroughbred. The foundation stock was an admixture of Eastern mares and stallions, and Galloways and other British horses. Three phenomenal stallions -The Darley Arabian, The Godolphin Arabian and the Byerley Turk – dominated Thoroughbred ancestry, and every Thoroughbred traces in the male line to just these three. The desert is no breeding ground for weaklings. With a climate of extremes, scarcity of food, and the hard work expected of horses, it was a cast of survival of the fittest. In the days when the tribes were constantly at war and ghazus or raids were a regular occurrence, the Arab relied on the speed and endurance of his mount for his very survival. Mares were used for forays against enemies, as stallions could not be relied upon to remain quiet, and the Arabian mare thus became a most treasured possession of their owner and was frequently stolen in war, if not the actual object of a ghazu. When fighting the rider carried a lance (which in some Northern tribes could be as much as 6 meters long) and the mare had to be extremely agile, able to stop dead in her stride, spin on her hocks, and dart off again. The mares were kept tethered in the Bedouin camps and sometimes shared a tent with their master. Centuries of living in close proximity with humans have endowed the Arabian with an exceptional ability to form strong companionships with people. Although during the 16th and 17th centuries many Eastern stallions and mares were brought to England and other countries in Europe, they were used almost entirely for crossbreeding. It was not until the latter part of the 19th century that the breeding of purebreds began in earnest in England. Wilfrid and Lady Anne Blunt were well known 19th century travelers in the Middle East. Blunt became fascinated by the traditions and philosophy of Islam and both he and his wife had a particular interest in horses. In the winter of 1877-78 the Blunts stayed in Aleppo with the British Consul who had acquired, over many years, knowledge of the horse breeding Bedouins. It was here that they formed the plan of collecting Arab horses to found a stud at Crabbet Park, their home in England, thus preserving the breed outside the Middle East: a course of action which was to have far greater influence throughout the world on Arab horse breeding over the next 120 years than they could ever have imagined. The Blunts made three desert journeys to visit the main horse-breeding tribes and purchased stallions and mares. They were aware that high quality asil (pure) Arabs were already becoming scarce in Arabia and they chose their foundation stock extremely carefully, both as to antecedents and for quality, conformation and general soundness. To these original desert importations the Blunts later added the best of the remnants of the famous Ali Pasha Sherif Stud in Egypt. Their stud became famous and buyers from all over the world purchased their stock. 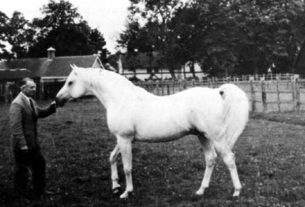 The Blunt’s only daughter, Judith (later Lady Wentworth), carried on the stud after their death and continued to sell breeding stock abroad. 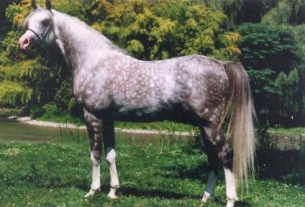 Although there were other exportations, from Arabia to countries around the world, today there is hardly an Arabian Stud Book in existence, which does not contain animals with Crabbet-bred horses in their pedigree. There were, of course, other importations into England, too, such as Miss Dillon’s stallion, Maidan, who came to England via India and was purchased by her in 1889. Well known for his racing prowess in India, Maidan was then 21 years old but still did a season’s hunting in Suffolk and even won a steeplechase. The first stallion imported by the Blunt’s, Kars, had been ridden by a Kurdish chief to the war in Armenia in 1877 and had a miraculous escape although hit twice by rifle fire. Within weeks of his arrival in England Kars ran with distinction in a hurdle race; he became Wilfrid Blunt’s favourite mount and was hunted for several seasons. Up to the Second World War there were a number of small studs breeding pure-breds as well as the Crabbet Stud. One notable horse was Sainfoin, principle stallion at the Courthouse Stud. He was the personification of what the Arabian should be – a beautiful show horse who also performed successfully under saddle. Between 1927 and 1936 Sainfoin was the stallion champion at the A.H.S. London show 7 times, won the ridden class 3 times and in 1929 won a 1-1/2 mile race. 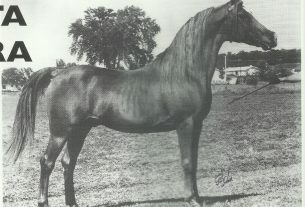 The emergence of the Arabian as a popular breed began after the Second World War, with the most dramatic population explosion taking place in the U.S.A. They are being bred in great numbers as show horses and for all kinds of performance work. Arabians make perfect riding horses and although some may consider their lack of size a disadvantage, they do not feel small to ride, due to their natural balance, good conformation and harmony of action. The Arabian is the swiftest pure breed, Thoroughbreds and Quarter Horses, which are fast over short distances, both being of mixed ancestry. Horse racing began in the Middle East. Arabians have raced in Egypt, Syria and Persia for at least 1000 years but it is only during the latter part of the 20th century that Arab horse racing has developed into a major sport. Arabians can claim to be capable of competing with considerable success in most equine sport disciplines. They were used centuries ago for chariot racing and also for the game of stick and ball, forerunner of modern polo. In India, before the First World War the ‘Gulf’ Arabs, as those horses imported from the Arabian Gulf into India were sometimes called, were expected by their masters to do anything demanded of them. In between carrying an official or acting as a charger for an Army Officer, they would race, play polo, take part in gymkhanas and go hunting or pig-sticking. In the U.S.A. Arabians have taken part in Carriage Driving and Combined Driving, where the horse has to pull a heavy carriage over different types of terrain and execute various maneuvers. A steadily increasing number of riders of Arabians are now competing in dressage, but it is more common to see them competing in open competition against all breeds in countries outside Europe. There are many instances of pure-breds competing successfully in show jumping. Across country they show great determination. It might be assumed that they are too small to tackle a big course, but an Arabian of only 14.3 h.h. proved what could be achieved through consistent pluck by winning Eventing Championships in Norway and Finland. However the larger Anglo-Arabs and Part-breds are more appreciated for eventing and several have completed at top level in recent years – including two which became members of British International teams. Arabians are slow to mature and it is wise to give them plenty of time to develop fully physically, before competing in the more arduous work such as racing and endurance. It is generally acknowledged that the Arabian is the breed par excellence for endurance riding. Scientific tests have shown that the Arabian’s innate qualities of efficient heart, superior blood composition and endurance-orientated muscle fibre, surpass those of other breeds and prove it eminently suitable for this particular work. In addition, its characteristic generosity and willingness to give the utmost make it the most popular choice. There are, of course, other breeds, which have excelled in endurance but most can be found to carry Arabian blood in their veins. Arabians hold most of the records for total miles completed and many go on competing up to a veteran age. In most of the greatest rides, such as the Tevis Cup in the U.S.A. and the Quilty Cup in Australia, Arabians or their derivatives completely dominate the scene. Published in the Arab Horse Journal of the The Arab Horse Society News Winter 2000 issue, and reproduced with permission.